Lamb’s quarters, also better known as pigweed, is a lovely spring green that when cooked has a flavor reminiscent of spinach. For tonight’s appetizer course, it’s paired with chopped Campari cherry tomatoes and creamy cow’s milk ricotta cheese. Warm 1 tablespoon extra-virgin olive oil in a large skillet over medium heat. Add lamb’s quarters and sauté for 2-3 minutes or until greens wilt and become tender. Remove from heat and set aside. Gently warm 1 tablespoon extra-virgin olive oil in the same skillet. Add garlic scapes and lemon zest. Sauté for up to 2 minutes or until garlic scapes turn a bright green and zest starts to crisp. You’ll have to watch closely so that the zest doesn’t burn. Spoon into a small bowl or ramekin and let cool. Combine ricotta cheese and garlic scape mixture. Mix well. Taste for salt and pepper. In a separate bowl, mix together tomato water, remaining tablespoon of olive oil, sea salt and black pepper. To assemble: Spoon lamb’s quarters onto a salad plate. Spoon tomatoes over greens. Place a dollop or two of ricotta cheese next to the salad. Sprinkle tomato water dressing over the salad. 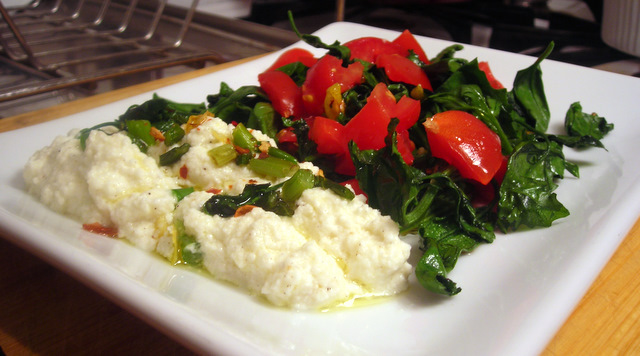 Drizzle ricotta cheese with a little extra-virgin olive oil and serve at once. Time: 20 minutes, including prep. Tomato water can be made a couple of days ahead. You will need 6 large tomatoes that have been cored and removed of most excess interior flesh. Bring a large pot of water to a boil. Have a large glass bowl full of ice water ready. Make an incision at the base of each of the tomatoes with a small knife, in the form of an “X”. Drop the tomatoes into the pot of boiling water for approx. 10 seconds. Lift each out immediately with a slotted spoon and plunge into the bowl of ice water. This step will halt the cooking process and ensure that the skins will be easily removable. Remove the tomato skins and discard. Dice the tomatoes coarsely. Purée in a food processor or blender until liquefied. Pour the resulting mixture into a medium saucepan and set over high heat. Bring the tomatoes to a boil, then remove from heat. Set a strainer or colander lined with 5 layers of cheesecloth over a large heatproof bowl. Carefully ladle the puréed tomatoes into the cheesecloth-lined strainer. Let the tomato liquid drip into the bowl. The resulting tomato “water” should be a clear pale-gold liquid that’s free of any tomato pulp. Use in salad dressings, cocktails, sauces or soups. Keeps for up to 4 days, refrigerated. This recipe makes about 3 cups of tomato water. The next salad is adapted from a recipe from a new foodblog that I discovered today, She’s In The Kitchen. 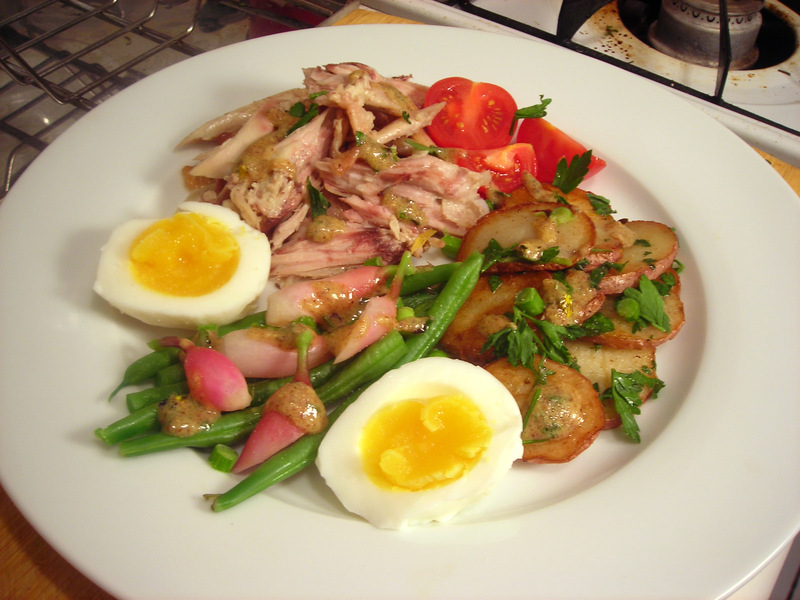 This version of salade parisienne contains (clockwise from upper left): cold leftover roast poussin from Sunday’s dinner, Campari cherry tomatoes, new potatoes fried in French butter, hard-cooked wild turkey eggs and blanched green beans and French breakfast radishes. The dressing is the same as in Katrina’s recipe with the exception of the addition of chopped edible nasturtium flowers, 1 minced garlic scape and chopped parsley. The lamb’s quarters and tomato salad will be my submission for Weekend Herb Blogging #288, currently hosted by Winnie of Healthy Green Kitchen and organized by Haalo of Cook Almost Anything. Weekend Herb Blogging is a weekly foodblogging event that was originally begun by Kalyn of Kalyn’s Kitchen. 15 Jun	This entry was published on June 15, 2011 at 12:41 am. It’s filed under cooking, food, food photography, French food, general, recipe, spring, vegetarian, Weekend Herb Blogging and tagged chicken, cooking, dinner, eggs, food photography, foodblogging, garlic scapes, green beans, lamb's quarters, lemon, locavore, potatoes, radishes, recipe, ricotta cheese, salad, tomatoes, vegetarian. Bookmark the permalink. Follow any comments here with the RSS feed for this post. Your salad looks fantastic- so nutritious, too! Thanks for submitting to WHB #288!